Pirates march the in the Gasparilla Parade on Saturday, Jan. 27, 2018. A man poses for a photo with his dog during Gasparilla on Saturday, Jan. 27, 2018. The man and his dog were dressed like pirates. Sky10 took aerial shots of the Jos&eacute; Gasparilla ship docked next to the Tampa Convention Center on Saturday, Jan. 27, 2018, as part of the Gasparilla Pirate Festival. Sky10 took aerial shots of the ships in the Hillsborough Bay on Saturday, Jan. 27, 2018, as part of the Gasparilla Pirate Festival. The Jos&eacute; Gasparilla ship arrives in the Hillsborough Bay as it gets closer to the Tampa Convention Center for the Gasparilla Pirate Festival on Saturday, Jan. 27, 2018. The José Gasparilla ship arrives in the Hillsborough Bay as it gets closer to the Tampa Convention Center for the Gasparilla Pirate Festival on Saturday, Jan. 27, 2018. The Jos&eacute; Gasparilla ship arrives in the Hillsborough Bay as it gets closer to the Tampa Convention Center for Gasparilla on Saturday, Jan. 27, 2018. The Stanley Cup had a tiny life vest wrapped around it aboard the Jos&eacute; Gasparilla ship on Saturday, Jan. 27, 2018. Boats gather in Hillsborough Bay for Gasparilla on Saturday, Jan. 27, 2018. 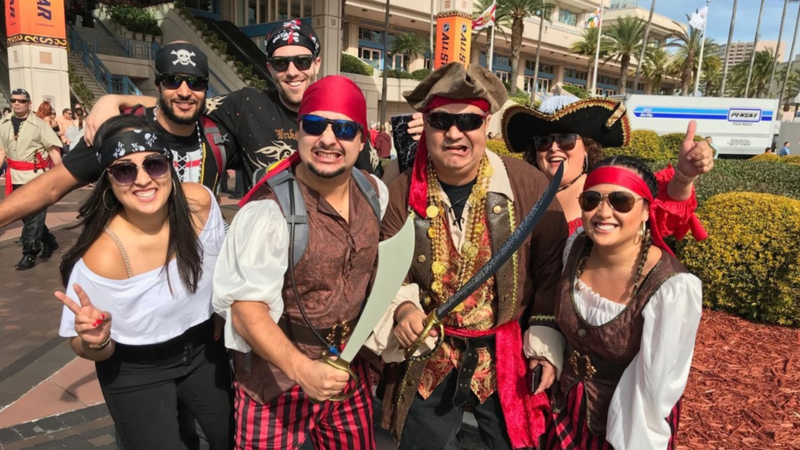 Pirates pose for a photo for the Gasparilla Pirate Festival outside of the Tampa Convention Center on Saturday, Jan. 27, 2018. 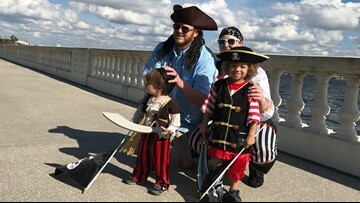 People pose for photos ahead of the Gasparilla Pirate Festival on Saturday, Jan. 27, 2018. 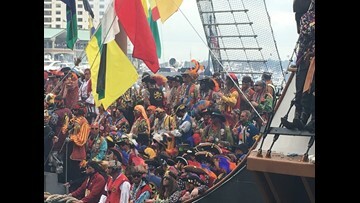 Sarasota police officers prepare to join several Tampa Bay-area law enforcement agencies ahead of the Gasparilla Pirate Festival on Saturday, Jan. 27, 2018.